This dish is perfect if you want something that will feed a crowd inexpensively, and takes very little prep and cooking time. It's flavorful, and quite frankly, turned me into a pork tenderloin lover. While it may not be the ideal summer dish (it's not exactly "refreshing"), it is satisfying on those nights that you want a warm, hearty meal. 1. A couple hours, or ideally a day in advance, season the pork tenderloin with salt, pepper, and rosemary. Cover in a baking dish and set in the refrigerator. 3. For the potatoes, cut into large chunks and leave the skins on. Season the potatoes and pearl onions with salt, pepper, and rosemary. Drizzle with olive oil and mix together. 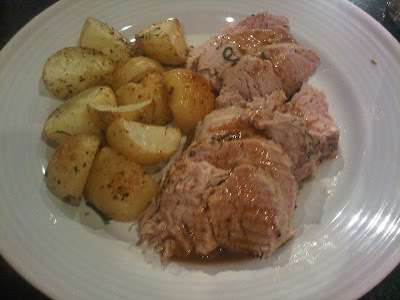 In the same dish that the tenderloin is in, place the potatoes and pearl onions around the pork. Remove the pork and start baking the potatoes and onions (they take longer than the pork). 4. Set a large frying pan on medium-high. Heat approximately 2-3 tablespoons of olive oil. Once oil is heated, sear each side of the pork tenderloin for approximately 3 minutes. 5. After potatoes have been cooking for 10-15 minutes, remove the dish from the oven. Place the seared tenderloin back in the center of the baking dish. Surround the pork tenderloin with potatoes and pearl onions. 6. Place the dish back in the oven and bake for another 30ish minutes (this will vary depending on your oven). Remove dish from oven and take a bite of potato to make sure it's cooked through. Let the pork tenderloin rest for 5 minutes before slicing (tenderloin should be hardly, but slightly pink on the inside and nice and juicy!). Drizzle with gravy. This dish pairs well with a nice Riesling!